It has been a hectic week where I chased king, models and demonstrators. And then, dateline. But I finally get over to see the tub of lard with a dark glasses wrote. Btw, I read in some women mag that men who don cool image, using dark glasses and cap, are usually ‘inadequate’ down there, so sort of a compensation. Then again, I digress. So, he can’t spell pail. Never mind. And I read on his blog he said he has been a Catholic since he went to catechism. So, yeah, I went OMAIGOD!!!???!!! Now this is sensational. A Catholic man made a police report against a Catholic mom with five kids, one of whom had died, which is why I turned Catholic not so long ago, btw. There I digress again. One, I had retorted to him immediately when he demanded I retracted what I tweeted. This screwed up guy said I mix religion with politics. And I was like wtf, who the hell are you to ask me, The Obnoxious 5xmom to retract what I said? I asked him where did I mention anything about politics? Now, I know where he got the screwed idea from. He thought I am referring to the Bersih rally. Farker…if I am a Bersih advocator, I would have pinned a yellow badge on my avatar, repeatedly ask everyone to join. Go and check all my status (not that you can because my tweets are protected). Does the ‘they’ means the government, stupid? It is just a Christian expression that we are so used to. Next, you violated my protected tweets. You join as my ‘friend’ and abused it. Don’t you see how disgusting that is? It is protected. we should march (march in a Christian way means to be brave and not cower, to stand for justice and rights not just for us but for all the downtrodden, weak, trampled of the society. Didnt they teach you any songs when you were a kid? Or were you too busy stuffing your fat face to listen to teachers? Havent you sing before ‘We stand for God and for His Glory’. Does that mean you practically stand and never sit down?) It is certainly not about Bersih, idiot Tony. It is just an expression. and yes, I did say ‘for the persecution THEY have done to us and our Lord’. Here again, ‘they’ did not mean the government, idiot. Oh have I said that before? Never mind, you deserve it. Do you even read The Herald? Do you even know that Christians are sometimes killed in other countries for their faith? Do you dare to go to your parish priest and tell him that we Christians do not go through trials, injustices? Come, I challenge you, let’s go to a learned person and we ask him if I had been wrong to lament that we need to stand together as Christians and by that, as united Christians that we have our duties to be the strength for those who are weak. By being united doesnt mean we separate ourselves from the world, moron. It means, Be part of the world. And again, idiot, don’t misinterpret my words. Weak means the poor, the sick, the marginalised. I continue my tweet with ‘I don’t know.’ Which again shows it is a lamentation. Betcha you never read the Bible enough to know what Lamentation is. And I said I am going to sleep, bye bye and I even put a smiley face. So, you are an idiot. The police may come and drag me for questioning. Or they may terus come and arrest me and messed up my stuffs. I live by my faith. I accepted these as part of being in Christ. And I forgive you. I won’t hold you in grudges. Because Jesus said Forgive your enemies. And I will because it will make you pissed off more. Because people will know how stupid you had been. 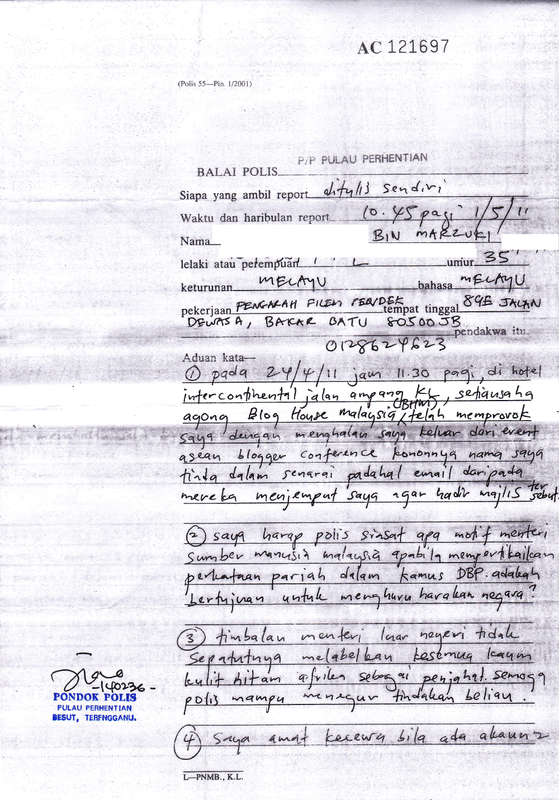 SO, PEOPLE, TONY YEW MADE A POLICE REPORT AGAINST ME BUT I FORGIVE HIM. So, yeah, that’s the end of the chapter. And to all my Muslim friends and to those who came by from Utusan or Astro Awani or Sinar Harian, sorry that my brother Tony Yew has caused you uneasiness. Forgive him. for he does not know. Saya minta maaf kepada semua yang salah sangka dan terpedaya dengan kejahilan semua ini. Tuan-tuan dan puan-puan boleh jumpa dengan saya dan nilai sendiri samada saya ini seorang yang begitu fanatik seperti Tony tuduh atau pun tonton lah di TV3! Ingat tau, layari blog resipi saya di http://malaysiabest.net ! Saya ada resipi untuk sahur. What a douche-bag! Idiot! F@rker! How lifeless can he be la.. Hes a blooy arselicker..
Kena from the typhoon liao. 🙂 Pardon my language but I have read how he retorted to his negative comments on the blog so I have to speak his language so that he can understand. I wonder whether he’ll lodge a police report against the whole church if they were to sing the hymn ‘Onward Christian Soldiers”. He spelled tweet wrong also. I salute you for standing for what you believe in and in being true to yourself. Wow, didn’t know you big celebrity chef also, among other things! love your blog, your writing, your no holds barred persona. and what’s wrong with this idiotic moron tony?causing a big huha over some silly tweets? On his blog, he castigates you, like the pharisees, for allegedly inciting Christians to march. I did not know you had such powers akin to archbishops and such. He then asks like a blind man asking his fellow blind men, “Can you see it?” It’s hilarious after reading your retort and idiocy of it all! When I was a kid, during Jap occupation, the villagers would catch the Jap informant for making false reports and tie him up good and proper and then use razor blade to make small cuts all over his body and then pour salt water. This is repeated until he is extinguished. But I guess this takes place in a more civilized society, sumore he has suffered so much when his wife was terminated from MAS for being pregnant with a third child…aiyah anyway that’s another story. He and rocky bru go backs a long way. Wink-wink. 1. He wrote to bloggers begging them to blog about his wife case. 2. The Blog House they are running is collecting funds to protect bloggers. 3. They claim to defend the freedom of expression. 4. He is 41, and at that age, still a pengendali laman web who does not even have his own dot com. Loser! 6. He picked on the wrong person. Blog House is registered with ROS and they have collected funds amounting to RM25K to protect bloggers. I wonder if I can ask them to fund me since I am a blogger longer than Rocky Bru? Lilian, fully support you. As Catholics/Christians we are called to be the salt of the earth. We are called to stand up for the right thing.Ignore the kakibodek and his fellow kbs.If Jesus were alive, He would probably slap him. Then if he turns his other cheek, Jesus would slap that one too. Advice to the tub of lard, JANGAN JAGA TEPI KAIN ORANG. I’m sure u have FAR greater goals to accomplish. So cheap borrow your name and popularity to gain more click to his blog… His blog is boring. Spot on….he kena kow kow. He got bought 2 weeks before Pematang Pauh by-election. Good on you, dear. As a fellow Catholic, I am also very ashamed we have someone like him and his friend that Frieddie Kevin fellow in our midst. Wolves in sheep clothing. Nothing more than a publicity stunt for his stupid blog which most don’t bother reading. at least you make sense… what that tony guy said doesnt make any sense to me. How can he be a Catholic and not represent or defend his faith? !